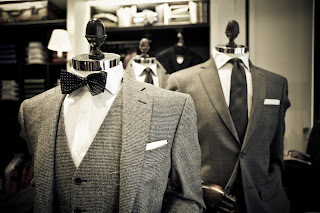 One of the main reasons that I (and I assume most other men) read blogs is to get inspiration for things to wear. Or to buy in order to wear. I know I should write more posts on the former. Ideally, every shop window should provide such inspiration on combinations. But they don’t. 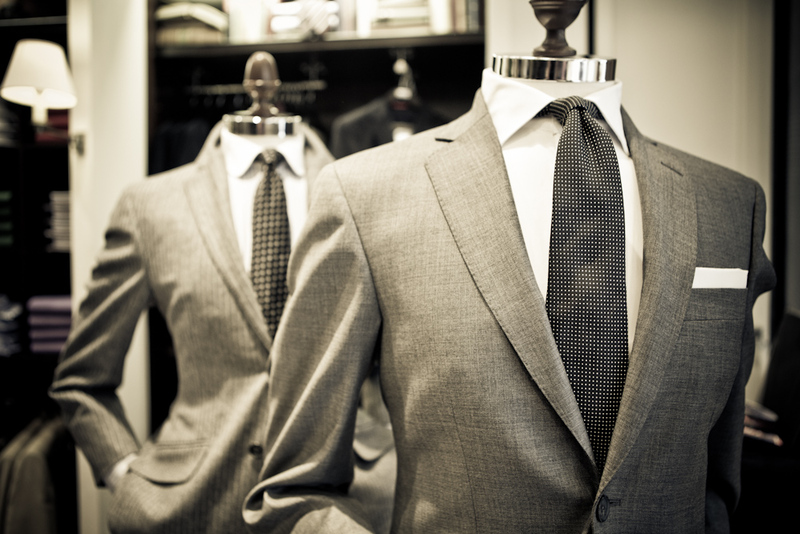 There are notable exceptions, including Ralph Lauren, Boggi and boutiques like Trunk or Drake’s. 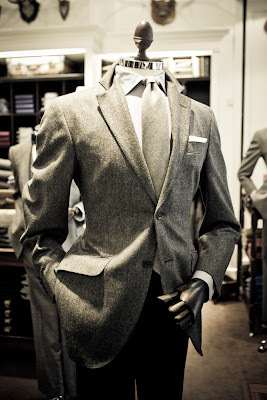 But in my opinion the most stylish window dressing of any brand in London belongs to Hackett. Hackett windows rarely shout. Ralph Lauren is more likely to do that, with preppy primary colours and glamorous evening wear; but it also occasionally misses the mark. Hackett provides quiet, consistent inspiration. Men of the City take note. For this post I have deliberately chosen a very simple display. These outfits, currently gracing the windows of the Jermyn Street branch of Hackett, contain no colour. But by taking this out of the equation, and trying to come up with six tonal combinations that highlight pattern and texture, they succeed all the more powerfully. Throughout there is sufficient variation in the scale of patterns to avoid clashing. The fact the shirts are white also helps to separate them. 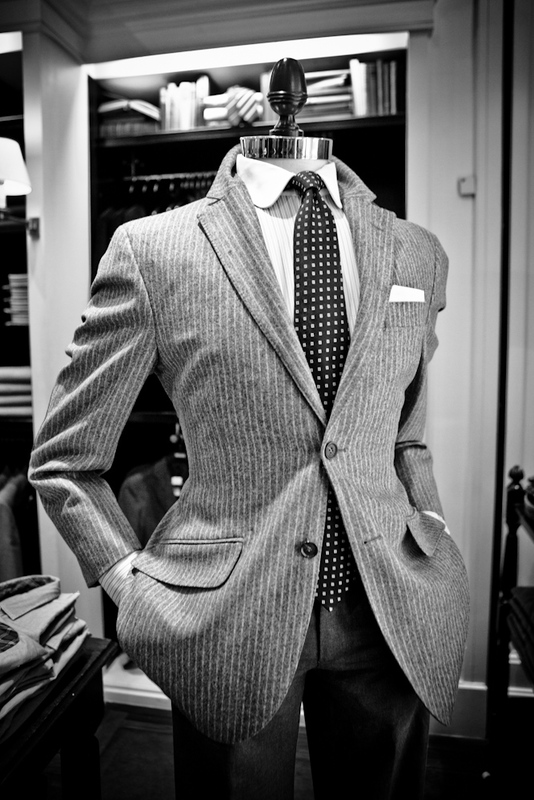 Interest is achieved through texture – the ties vary from woven pin-dot silk to satin to cashmere. It’s not complex, but it is simple and elegant. And that’s where all men should start. Even Hackett doesn’t get it right every time, and I have deliberately left out one combination that I felt didn’t work. It involved a chalk stripe waistcoat with trousers of the same colour but no pattern. Striped garments as separates are hard to work at the best of times. When the colour or tone of one piece is pretty much identical to that sitting next to it, the effect is of looking like you have worn the wrong trousers. The others are unqualified successes. I advise any man wandering down Jermyn Street, Sloane Street, Regent Street, Bishopsgate or anywhere else that Hackett has branches to look up and, briefly, take note. I believe the modern title is visual merchandiser. To whoever holds that title at Hackett, well done. You can follow the discussion on The window dressing of Hackett by entering your email address in the box below. You will then receive an email every time a new comment is added. These will also contain a link to a page where you can stop the alerts, and remove all of your related data from the site. I couldn’t agree more. Impeccably curated windows. I make a point of always visiting a store when I travel to London. Do I take it that you’ve ‘OK-ed’ the bow-tie combo in Hackett’s window? Two shots featured in the post. I know you’re not usually partial to the bow, and this example is quite a flapper as bows go. Hi Simon. I would most certainly enjoy those pictures if they were in colour. I don´t see the point of black and white in this case. Yes, reading it again my comment appears a bit more sarky than I meant it. I thought you weren’t much of a bow-tie fan and saw this as a possible ‘reappraisal’. Sorry if I seemed rude at all. No problem at all Roger, it wasn’t taken that way. Anonymous, the point of the ensembles was texture, pattern and tone, so colour seemed less relevant. All the outfits are black, white and grey anyway. I think my previous comment may have not made it on, so I will try again (me and technology!). What I mentioned, was that I think the English have a lot to learn from their French and Italian counterparts in re: visual merchandising. I was recently travelling in the north of Italy and was in awe of some of the window displays. One in Treviso in particular, showing their Cuccinelli wares, took my fancy and was also largely devoid of colours (largely subdued camel with some discreet flashes of orange). It was definitely about the textures and weaves and the beauty of the fabric and cut itself – this seems to be so misunderstood or undervalued at present. I often wear a woolen tie, and only the sharpest eyes notice it. I *really* like that bow tie – is it a bit bigger (wider) than most others? Something about it seems different – in a way that is very attractive to me. I’m sorry for bringing up an old post but I see you mentioned Boggi in passing here. I’d be interested in hearing any opinions you may have about them regarding quality, both in terms of service and production. That’s reassuring to hear! I bought a suit and a pair of chinos with them a few months back and while I’m actually very happy with both, a number of threads have come undone on the chinos. To be fair, they seem more like superfluous detailing than functional necessities (i.e. no undone seams or anything) but it’s still not what I had hoped to expect. 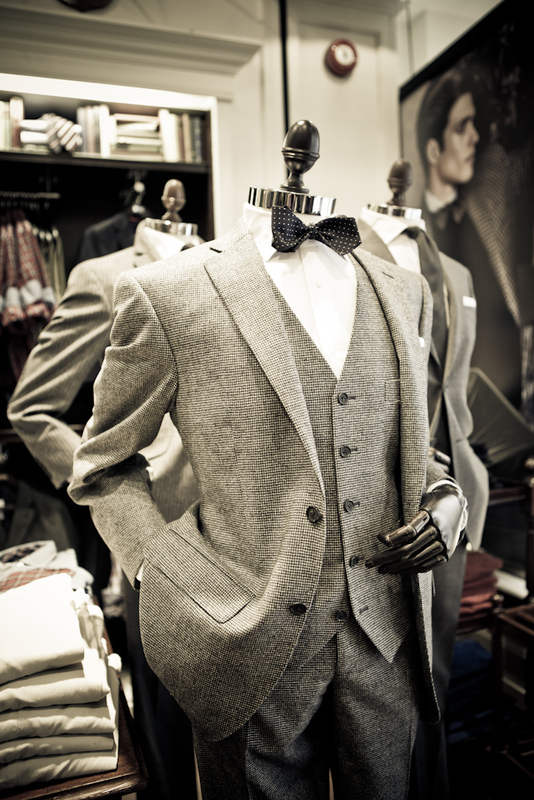 The suit however, bought at just under £700 including alterations has been wonderful. I was thinking of going back there to get another one, but figured I’d pick your brain first. Thanks for writing a fantastic blog! I ordered your book just last night from Amazon, expecting it shipped tomorrow. Looking forward to reading it cover to cover, and as well I’m very much looking forward to your next book!